Offering you a complete choice of products which include teflon gaskets, ptfe teflon gasket, ptfe gaskets and nylon canvas conveyor belt. We can manufacture Teflon Gaskets to any dimensions and in any shape. 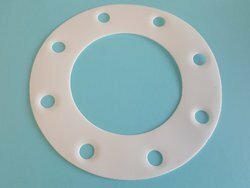 We can manufacture PTFE Teflon Gasket to any dimensions and in any shape. 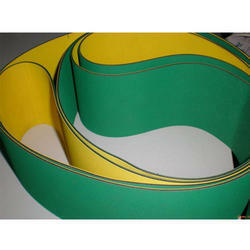 We are offering a wide range of PTFE Gaskets which is manufactured by moulding method with PTFE granular resin. PTFE Compared with other plastics has a superior property against chemicals and temperature because of such excellent properties, PTFE has a wide application as a sealing material. Nylon Canvas Conveyor Belt is used in synthetic rubber industry is currently the best performing varieties, the structure of warp and weft are woven nylon, the most widely used species, it is the most prominent advantage of good wear resistance, high strength, good fatigue resistance nylon canvas conveyor belt body made of thin, high strength, impact resistance, good trough, a large adhesion between layers, excellent flex and long life, suitable for long-distance, high load, high speed under the conditions of transportation of materials, widely used in mining, metallurgy, construction, ports and other industries. 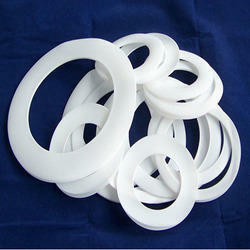 Looking for PTFE Gaskets ?